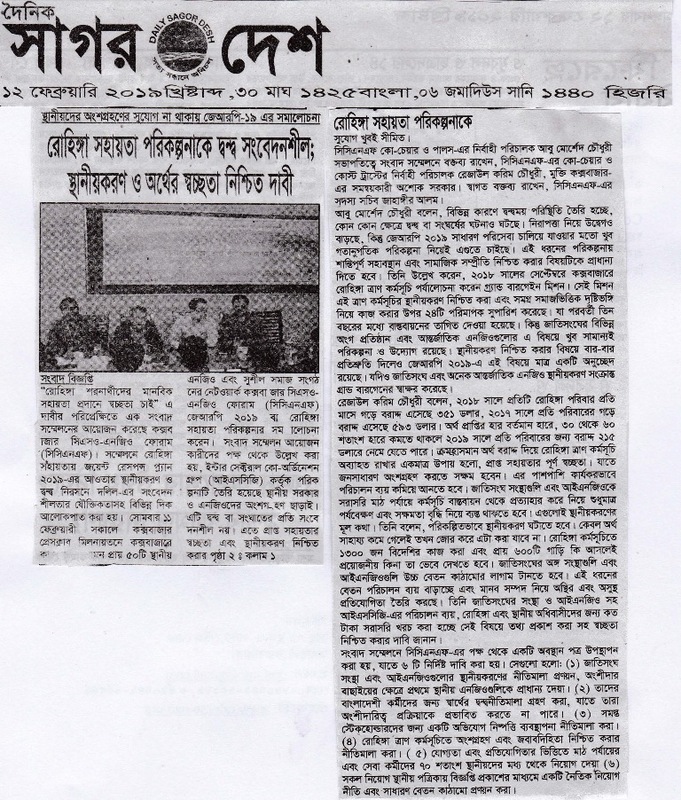 Cox’s Bazar, 11th February 2019. 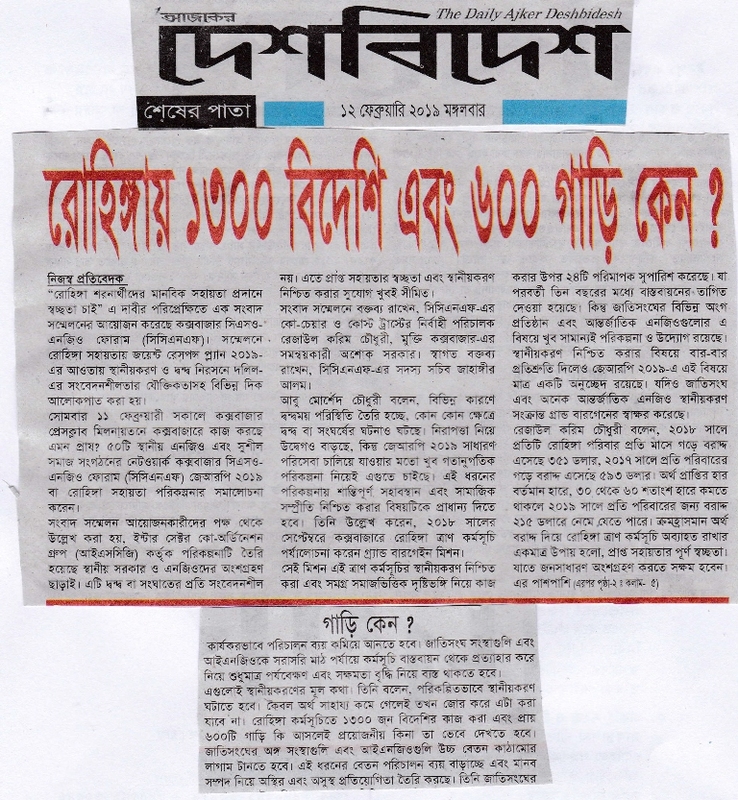 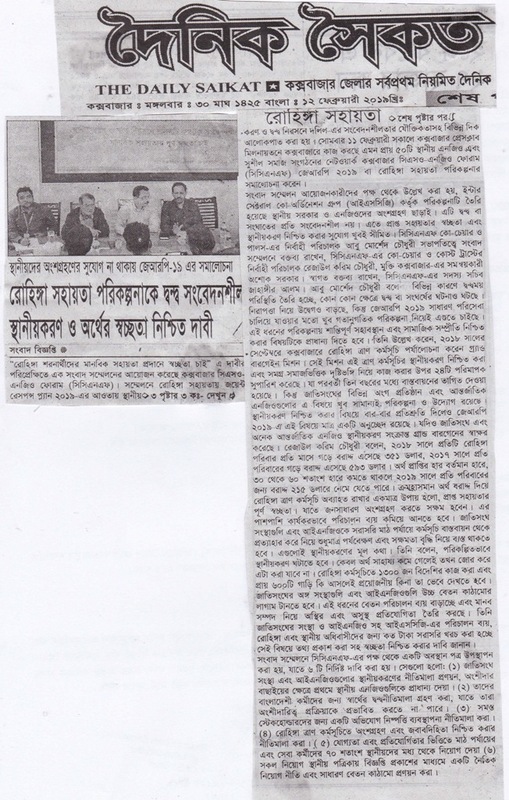 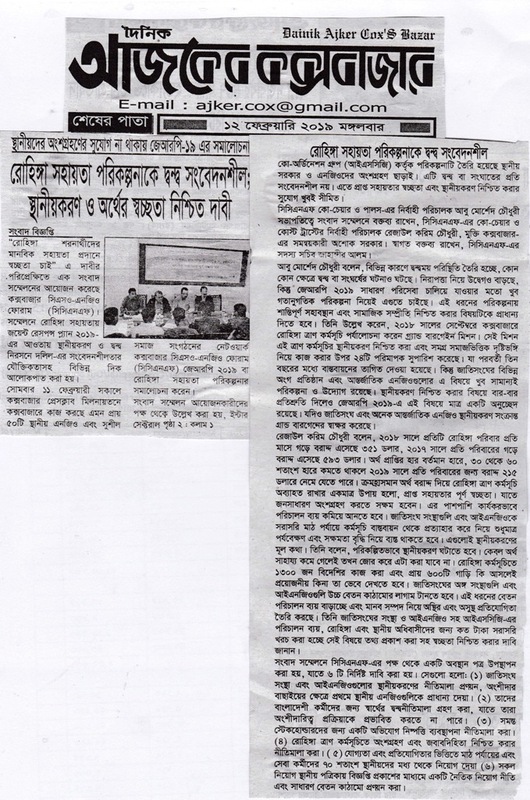 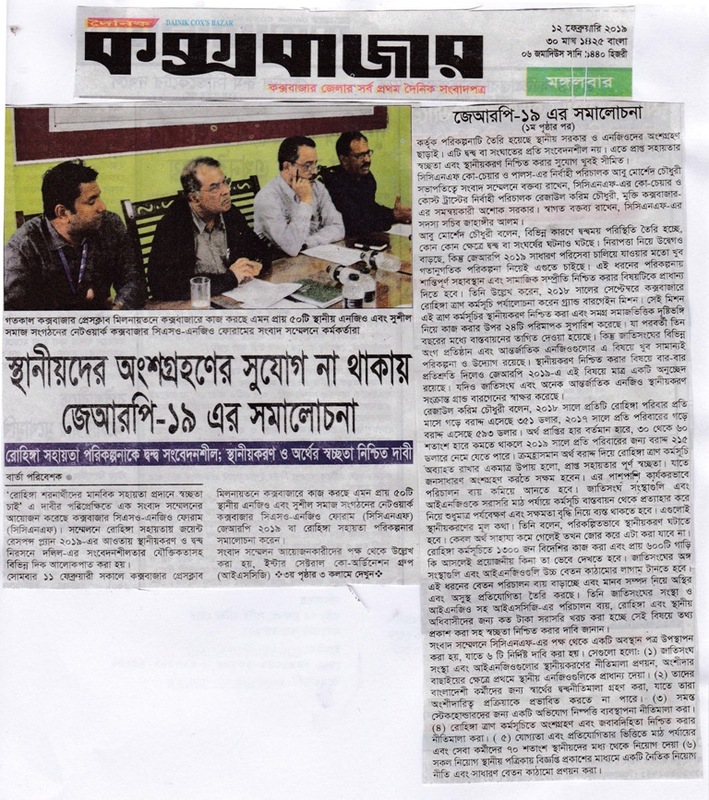 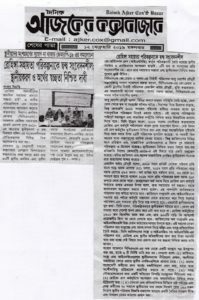 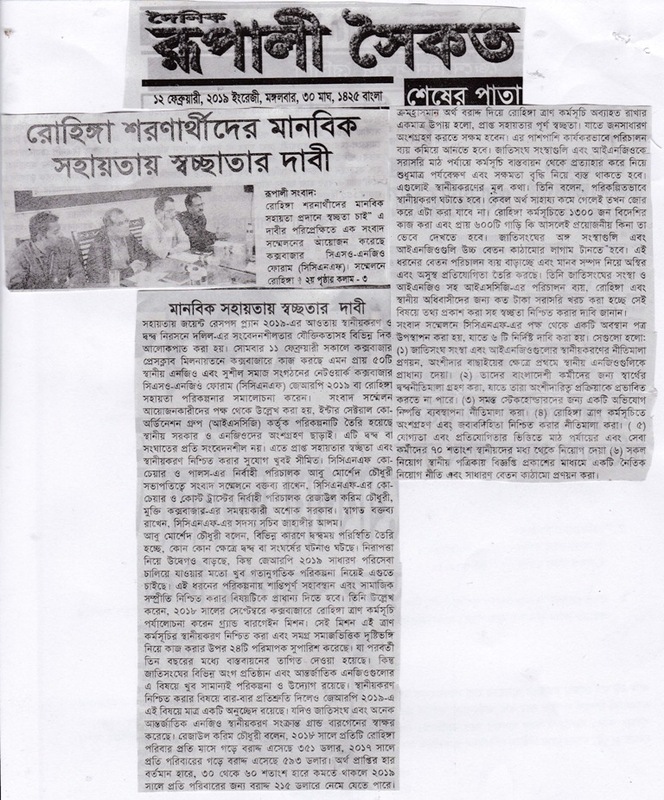 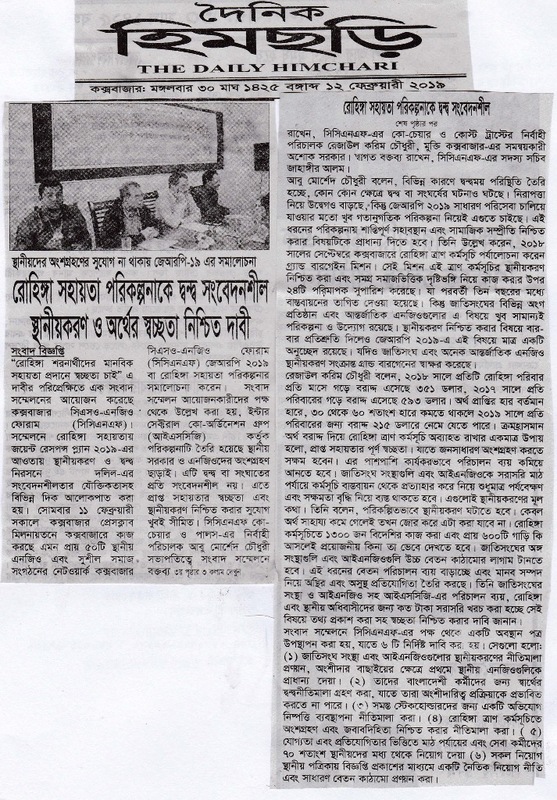 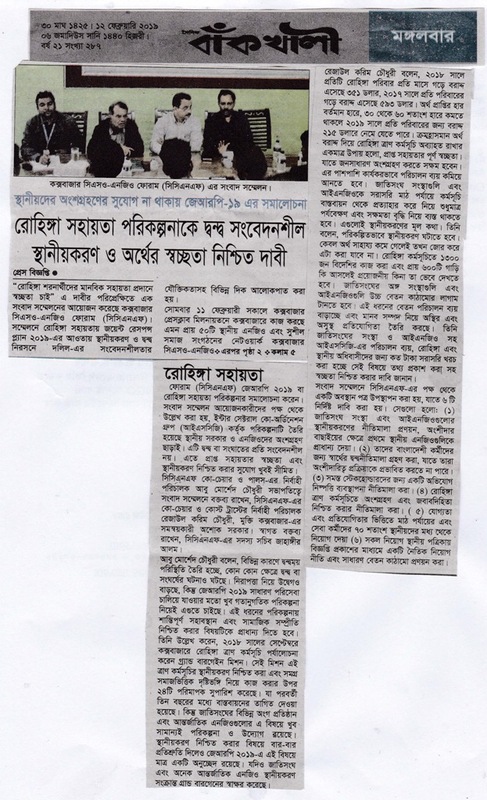 Today CCNF a network of around 50 local NGO CSOs working in Cox’s Bazar in a press conference in Cox’s Bazar Press Club criticize the JRP 2019, which was prepared by ISCG (Inter Sectoral Coordination Group). 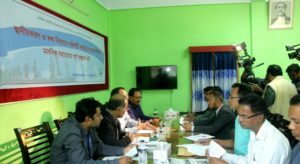 They mentioned that it has far short of participation of local government and NGOs, and it is not conflict sensitive, hardly transparent on aid and has very little on way forward toward localization. 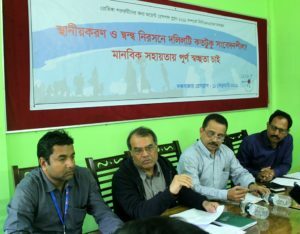 The press conference was presided by CCNF Co Chair and Executive Director PHALS Mr Abu Morshed Chowdhury, other speakers of the press conference Mr Rezaul Karim Chowdhury another Co Chair CCNF and Executive Director COAST, Ashok Sarkar Coordinator or Mukti Cox’s Bazar. 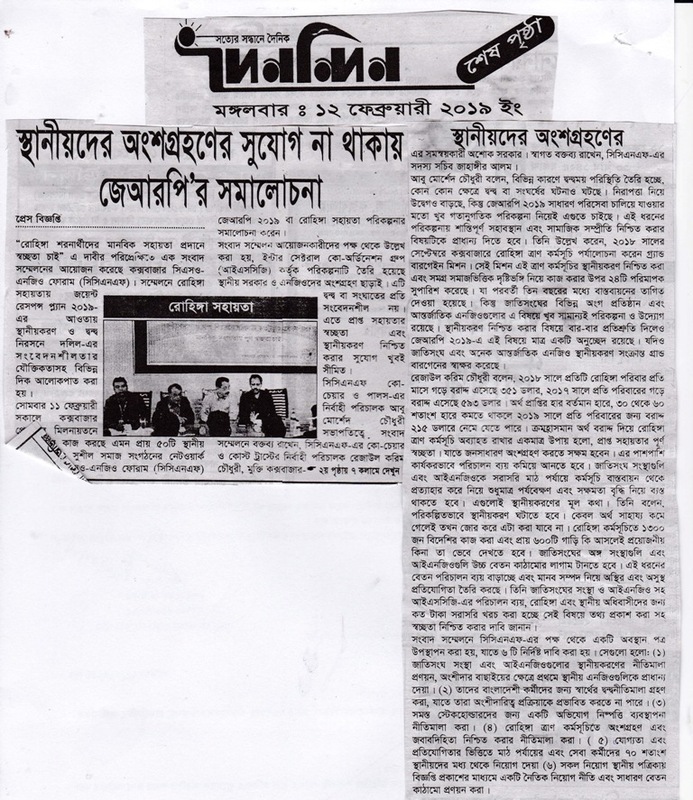 Zahangir Alam Member Secretary of CCNF placed the welcome message on behalf of the organizer. 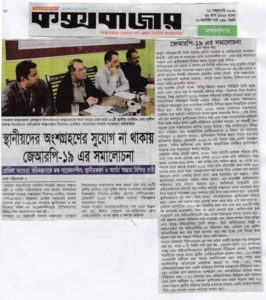 Mr Abu Morshed Chowdhury said that, now there are incidences of conflicts are arising and also there are security concern from different dimensions but the JRP 2019 overwhelm bias and business as usual to service delivery. 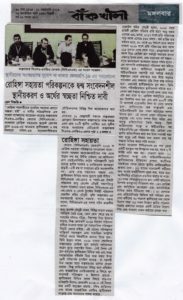 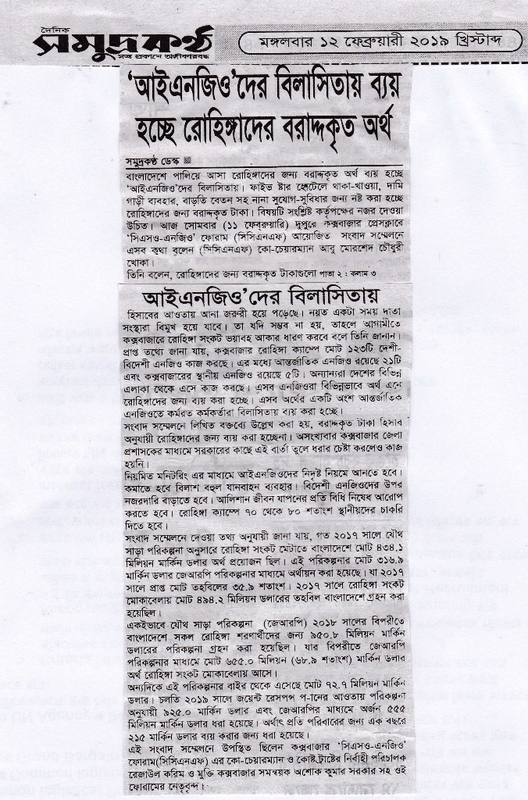 It should give importance to peaceful co-existence and social cohesion. 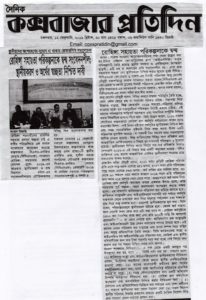 He also mentioned that there was a Grand Bargain mission in Cox’s Bazar during September 2018 which have recommend 24 parameter on localization and Whole of Society Approach and proposed a road map should be by next three year. 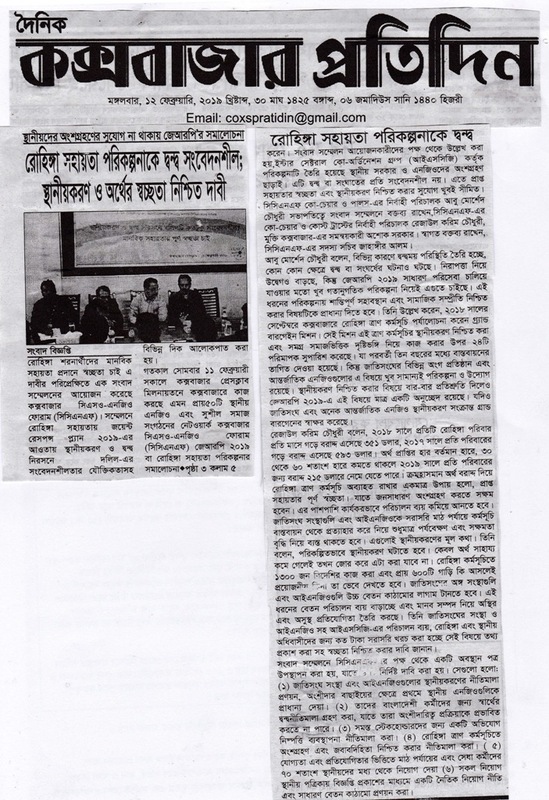 But the UN agencies and INGOs has little planning in this regard, especially in JRP 2019 there are only one para in this regard all though they are the signatory of Grand Bargain commitment, again and again reiterated their commitment. Mr Rezaul Karim Chowdhury said that, so far there are per month per Rohingya family has received $ 351, which was in 2017 $ 593, and it may go down to $ 215 in 2019, if one estimate the declining aid ratio, which is around 30 to 60 %. 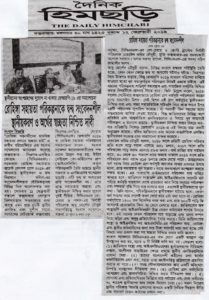 The only way to sustain the operation, the full aid transparency so that public will able to participate and propose to reduce transaction cost with effectivity continuously, UN agencies and INGOs withdraw from field operation that they will only busy in monitoring and capacity building, and it is the way of localization. He also said, localization should be happened in planned way, not by bound that when the aid will dry up, existence of 1300 expatriate and around 600 vehicle in the operation hardly demand driven, UN agencies and INGOs must stop the race of ever escalating salary structure which is raising operation cost and creating un healthy competition of staff poaching and a consumerist and unstable human resources. 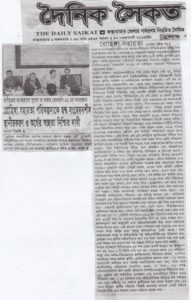 He demanded transparency of different classification of cost that ISCG including UN agency and INGOs should publish, ie, over head or management cost, direct input cost to Rohingya and Host community, and what is the ratio with local partnership cost. 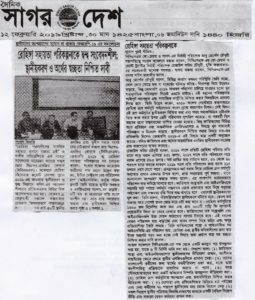 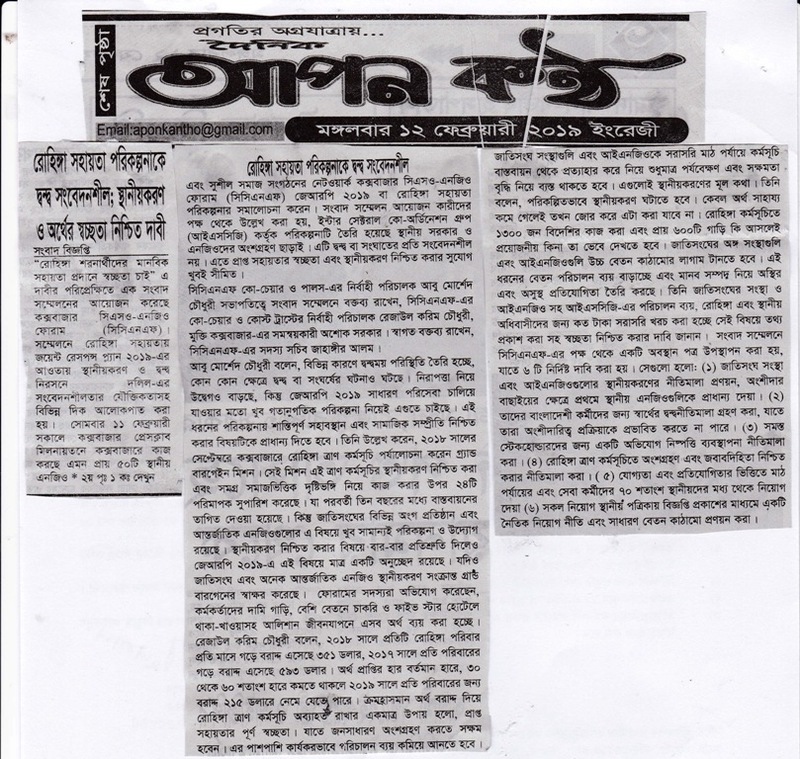 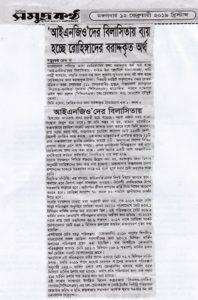 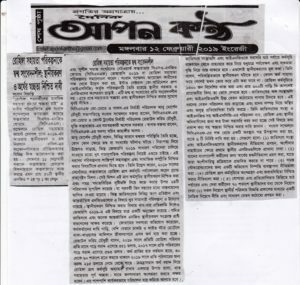 CCNF has circulated a position paper in the press conference, which outline 6 specific demands, which are (i) all UN agencies and INGOs must have localization policies, they should accommodate the local NGOs first in partnership, (ii) they should also prepare conflict of interest policy for their national staff so that they will not be able to influence in the partnership process, (iii) there must be a complain response mechanism open for all stakeholders, (iv) there should be participation and accountability policy toward Rohingya, (v) 70 % field operation and service staff job should be for local but with competition and quality, (vi) there should not be in any head hunting, all job circular should be publish in Cox’s Bazar, there should be an ethical recruitment policy and a common salary frame work have to be prepared and followed.